We decided to go with a fun girly theme for this week! Has anyone ever heard of the Bibbidi Bobbidi Boutique at Disney World? Of course you have, who am I kidding?? "Bibbidi Bobbidi Boutique is a beauty salon where young Guests are magically transformed into little princesses and knights at 2 locations: World of Disney Store in Downtown Disney Area and Cinderella Castle at Magic Kingdom theme park. It's hard not to feel perfectly pampered in this charming little boutique that's owned by Cinderella's Fairy Godmother and operated by Fairy Godmothers-in-training." 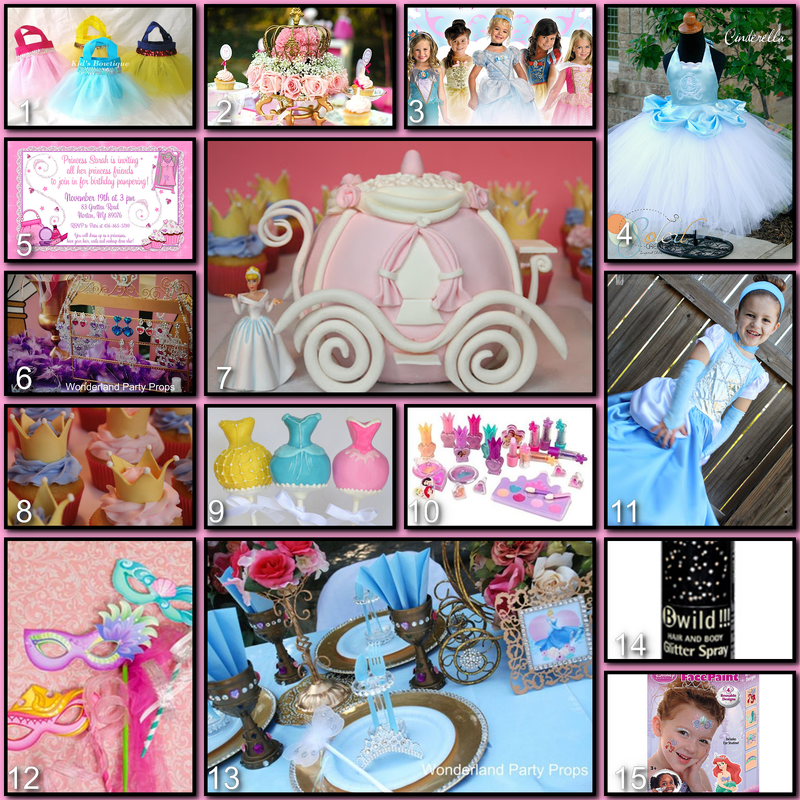 What if we brought the Bibbidi Bobbidi Boutique home to your little princess?! You can have your very own Fairy Godmother transform all of the attendees into their favorite princesses. Nails, hair, make-up, and dresses are all a must. You could have a separate accessory table where they could pick out their jewels. Decor is fun. You can do the theme in blue's or pink's. Have the table set up for a nice tea, with beautiful princess inspired centerpieces. Tutu Favor Bags - these bags are great to send home some make-up or nail polish! Centerpiece - While this centerpiece is a bit elaborate, you only have to have one and it's really beautiful. Princess Costumes - Each girl will have to have a costume to be transformed into her favorite princess. To save money you can ask each girl to bring their own costume or buy a costume trunk at WalMart with several costumes included. Cinderella Tutu - another option is to have the girls transformed into Princess Ballerinas. If you are crafty tutu's are reasonably simple to make. Invitations - be sure to let the princesses know this is a dress up party, this will give their moms an opportunity to inform you of any allergies. Jewelry - Is a princess really a princess without all of her jewels? Coach Cake - How gorgeous is this coach cake? And it's small since you are only feeding a few girls. Princess Cupcakes - Very cute and they coordinate beautifully with the Coach Cake. Disney Princess Cake Pops - These were so cute I couldn't resist!! Make-up - Kid friendly and easily removed, moms will appreciate that, I promise. Cinderella Costume - This dress is so beautiful, and home made!! Princess Masks - A great alternative to make up, and you can make them yourself. Place Setting - This is so regal looking, and everything is plastic!! The girls would feel very special at this table!! Glitter Hair Spray - The perfect finishing touch to their princess hair do. Press On Face Paint - Another great alternative to make up - and these can be reused up to 4 times!! Practice the hair and make up before the party to work out any kinks. Be sure to use cosmetics made for kids, ask parents about any potential allergies. Limit guest to 5-6 to ensure time to fix their hair and make up. Have other mothers help, they will love seeing the girls transformed. Be sure to have a fun photo shoot after all the girls are magically transformed into princesses. Here are a couple of YouTube videos to help you style the girls hair. This party can get out of hand financially, decide upon a budget and stick to it!! Other mothers may hate you because their little girls are going to want a party like this for themselves. I love the favor bags - those are adorable! We have had almost all princess parties for my girls' birthday parties and I am sure we will have several more. There are some great ideas here I can't wait to try! Thanks Beth!! I need Lexi to get a little older so Ash & I can throw her this party. Super duper cute!! Now maybe I should have another baby and make sure it is a girl just so I can do this...lol. Love it! LOL!! I love it Kelly! !